Probably the best known Austrian shipbuilders, Frauscher has been around since 1927. Founded in Vienna and originally named Frauscher Bootbauer, this family-owned builder is still as passionate and dedicated as back then. Their meticulously built motor and sailboats are among the loveliest to sail peaceful Alpine lakes, and it is little wonder their popularity among Western European yachting lovers is on the rise. With the beginning of the new millennium, the company expanded their portfolio with fast day cruisers modern in design and jam-packed with latest technology. Those attractive and unique, stylish and impeccably built boats found their way into clients’ hearts in no time. Frauscher presents new models almost every year, each and every one of them more popular than the previous. If Frauscher had ever hit a rough patch in the first place, we’d call this a renaissance. Frauscher 747 Mirage is somewhat of a thesis for the yard’s fifty skilled workers – a masterpiece that shows exactly how much they have all learned in the past decades. 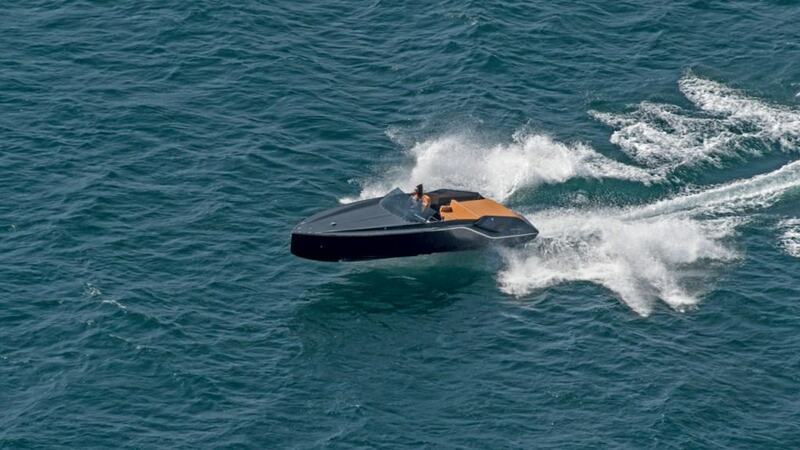 Equally expert in traditional methods and modern boat building technologies, the masters of Frauscher have created a truly unique little boat. Attractive for its design as much as for its character, the 747 is a smaller, but more radical version of the concept introduced with the 858 Fantom. Minimalist in design, the 747 has the look sand the feel of a classic sports car, and evokes some of the former, racing models of the builder. Designed by studio KISKA and Thomas Gerzer, the 747 has a deep V-hull designed by naval architect Harry Miesbauer. High quality stainless steel and dark gray gelcoat (gelcoat available in other colors) add to its minimalist look, stressing the ingenious and elegant lines of the hull, while the strong bow and wide, slanted sides create a dynamic feel to the boat. Frauscher 747 does not only look dynamic, it is dynamic – and those who know little of Frauscher may get a shock of a lifetime if they find themselves on it at full speed. 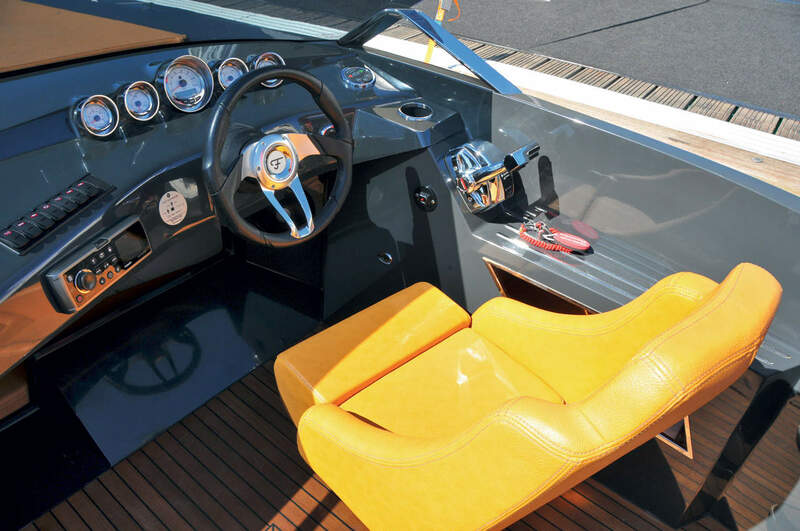 Powered by a 300-hp MerCruiser (options include a stronger and a weaker engine), Frauscher 747 pick up speed aggressively, like a real speedboat should, yet remains comfortable and safe. At top speed – 41 knots! – the boat owns the water, but maintains stability and feels tame enough for even less experienced skippers. Its sharp vertical bow cuts through waves with ease, and the cockpit is safe and more importantly, dry even at sharp turns of the steering wheel. For comfortable cruising, we suggest staying between 3000 and 4000 rpm, which allows 24-33 knots of speed and guarantees conservative fuel consumption (35 – 63 l/h). The skipper is well protected by the impressive five-instrument console and can pilot sitting in an adaptable seat, while guests can enjoy themselves in an elegant salon with teak floors, comfortable seating, high-quality audio system and a large refrigerator. The boat is equipped with several hidden storages, has a large aft platform and a starboard-side passage toward the bow. Right behind the console, the L-shaped sofa offers additional space for enjoying the sun rays, as its headrest can be lowered, while the mattresses of the bow sun bed can be detached and hidden in the tiny cabin under the deck. Frauscher 747 Mirage is sophisticated in every detail, a truly marvelous combination of modern design, advanced technology and traditional values. We are absolutely sure many a yacht owner will soon enough display a tiny Frauscher 747 right next to their mega-yacht or Mediterranean villa.